By now we have all seen the footage of the United Airlines passenger dragged off the plane. Bottom line, he wasn’t getting off without a fight and United wasn’t going to move on to another, less physically combative, passenger. Let’s face it, United F*****Up and it will cost millions. Secure the customers oxygen mask first. We know you sometimes overbook flights. Hell, that is a smart business decision on many airline routes (with lots of no shows, etc.). However, you need a solid back up plan that protects the customer. Seriously, how did it come to that viral nightmare? You had to screw up on so many levels. 2. You stopped “bribing people” to give up their seat. From what I understand, passengers were offered $1,000 in future airline travel if they were to give up their seat and take the next available flight. We all know it won’t really COST you $1,000. But it is an awesome gesture that many people are thrilled with. But this plane was different. These were high rollers. Frankly, it surprises me not enough people took UA up on the $1,000 voucher. Nope, these passengers were weighed down with money to burn and/or a date with destiny. So, what is an airline to do? Raise it to $1,250, then $1,500, then $2,000 if you have to. You don’t think four people would have got off the plane, gladly, for $2,000 in future air travel?! You bet they would. That is a family of four to Disneyland…or Seattle…or the Yarn Museum. So, you would have been out four $2,000 vouchers (if it even had to go that high). $8,000 total. Let’s take a step back for just a second. You have a FULL PLANE. You gambled. Overbooked the plane. And Lost. But did you really lose? Did I mention full plane? Oh yeah, I think I did. So, that “cost” is $8,000 versus the social media Sh*tstorm you have right now. Sure, there have been some awesome Meme’s* created in your honor but I don’t think that is the sort of free press you were looking for were you? *This one is still my favorite. Instead of forking out a few vouchers to cover your bad gambling debt, your mistake will cost you around 21.6 million dollars. *I really have no clue what it will cost United Airlines in cancelled credit cards, cancelled flights and people booking on other airlines in the near future. 21.6 million was derived by my thinking of a number that sounded impressive. What next? 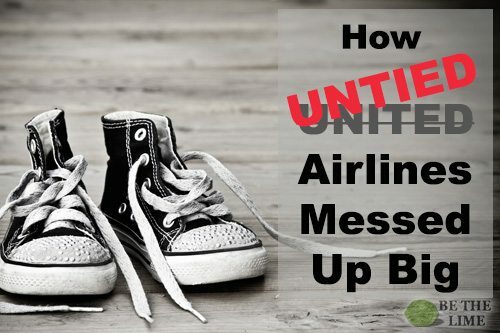 How can United Airlines flight-correct this mess? Again..secure the customers oxygen mask first…before your own. First off, is a simple honest public apology. So far, United has tried three of these, missing the mark each time. Telling the general public that the “fine print” has always given you the right to bump passengers doesn’t make people feel better about the situation. Secondly, since this policy was sooooo pubic, you need to address the policy and provide a better contingency plan. Third, learn from the mistakes and make a commitment, publicly. This is the part that is going to hurt. You need to admit to the public you screwed up (that was the apology part) AND state a renewed commitment to the customer (ongoing campaign). Change the internal message. Change the external message. Build a culture that begins to spread. Enlist your champions and use their testimonials. The public crucified you for this…the public can be used to pull you back out. Start with your (still) raving fans. There is no magic shortcut, but UA never should have been in that situation to begin with. As for me, I need to book a couple flights later today…I am pretty sure it won’t be on United for a while.